The artist formerly known as Gus has dropped the first-name-only tag and decided to go with his full name, Gus Black. He is also no longer on the now-defunct Almo Sounds, the major label that released his first two albums - 1996's Gus and 1999's Word of Mouth Parade. Calling Europe's Wild Abandon home, the pop songsmith has written his best album to date, Uncivilized Love, a precise singer-songwriter pop album that focuses around his tender voice and acoustic guitar. Backed by several friends and area studio musicians, Los Angeles-based Gus Black crafts genuine pop songs too elaborate and too smart for commercial radio. 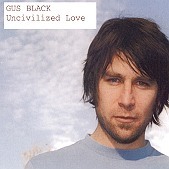 But fans of real pop music, songs written and sang by a person that means every word, will find solace in the graceful presentation in which Gus Black delivers every track on Uncivilized Love. Whether it's a haunting, primarily acoustic offering or a lush, full-on portion of what Gus Black is capable of, his mesmerizing melodies and delightful voice intertwine with the stunning rhythms, as you get swept away by the sheer beauty of the songs. I'll give this an A.